- Made of high density cotton canvas and PU leather zips, classic and fashion. It's a very durable shoulder bag. - Scientific and reasonable pocket lining design make your items lay in the bag systematically. There is a hole with a grommet to run your headphones through. - It has enough pockets and capacity to organize your basic survival gear, as well as to conveniently carry the stuff you have to access regularly, like iPad, iPhone, external charger, iPod, cords, headphones, sunglasses, credit cards, cash, mints, snacks, water bottle and so on. - Freely adjustable shoulder strap, you can adjust it according to your height and comfort requirements or use the handle. The stitching on this product is nice and very strong. 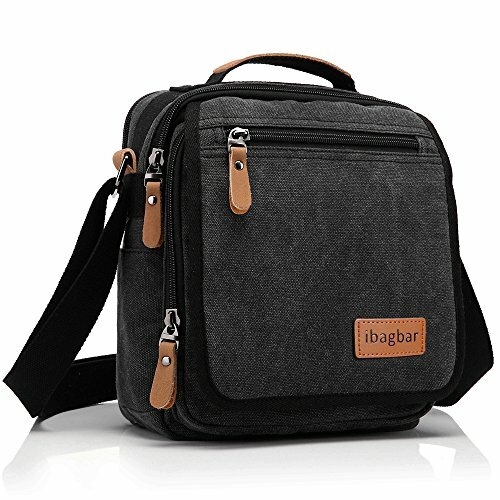 - Perfect messenger bag/shoulder bag/crossbody bag/handbag/ hiking or traveling Bag, suitable for office, school, outdoor, business and other occasions. - It must be the ideal gift for Birthday, Thanksgiving, Christmas, anniversary. What you can put in this Canvas Cross Body Shoulder Bag? - You can put A6 books, ipad, glasses, wallet, keys, cell phone, umbrella, document and cigaret in the bag. Main Material: Made of quality cotton canvas and real leather zips. 1 year warranty for all of our bags. It's an awesome messenger that you will receive many compliments from your family and friends.